Goya Guava Nectar - 42 Oz. Goya Mango Nectar - 42 Oz. Goya Papaya Nectar - 42 Oz. Goya Adobo Seasoning With Pepper - 28 Oz. Goya Adobo With Pepper - 8 Oz. Goya Beans Black - 29 Oz. 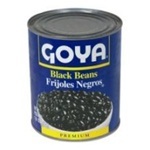 Goya Black Beans Can - 16 Oz. Goya Chiles Chipotles - 7 Oz. Goya Unsweetened Coconut Milk - 13.5 Oz. Goya Coconut Water With Pieces - 11.8 Oz. Goya Beans Black - 110 Oz. Goya Pigeon Peas Green - 15 Oz. Goya Guava Tropical Beverage - 16 Oz. 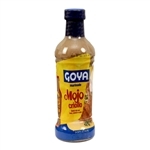 Goya Mojo Criollo - 24 Oz. Goya Mojo Criollo - 1 Gal. Goya Pinto Beans 16 Oz. Goya Red Kidney Beans - 15.5 Oz. Goya Azafran Sazon Econo Pack - 3.52 Oz. Goya Coriander and Achiote Econo Sazon - 3.32 Oz. Goya Coriander and Achiote Jumbo Sazon - 6.33 Oz. Goya Coriander and Achiote Sazon - 1.41 Oz. Goya Elhombre Vegetable Pigeon Peas Jack In The Box - 29 Oz. Chick Peas Garbanzos - 15.5 Oz. Ginger Beer Soda - 12 Oz. Canned Black Beans - 47 Oz. Melocoton Peach Nectar - 33.8 oz. Sazon Con Azafran 8Env - 1.41 oz. 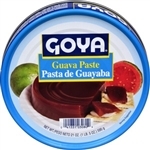 Goya Cream of Coconut - 15 oz. Goya Coconut Water Tall - 17.6 Oz. Pink Beans - 15.5 Oz. Goya Guava Prisma Nectar - 33.8 Oz. Plantain Chips - 5 Oz. Goya Sliced Beets - 15 Oz. Harina Pan White - 35.27 Oz. Organic Black Beans - 15.5 Oz. Goya Zucchini Flower Flor de Calabaza - 7 Oz. Pasta De Aji Amarillo - 8 Oz. Green Pigeon Peas - 29 Oz. Maggi Seasoning Sauce - 3.38 Oz. Harina Pan White - 5 Lb. Chipotles Chilies - 12 oz. Sweetened Condensed Milk - 14 Oz. Goya Plantain Chips - 10 Oz. Goya Plantain Chips - 2 Oz. Ready To Eat Pork Crackling Rind - 5 oz. Goya Maria Sandwich Cookies - 5.1 Oz. Maria Cookies - 3.5 Oz. Chick Peas - 29 oz. Peach Nectar Juice - 42 oz. Goya Plantain Hot and Spicy Chips - 5 Oz.